Like a detective trying to discover clues in an ancient crime scene, I try to puzzle out what made these faint tracks on the meadow snow. They wander across the snowy field like furrows set by an inattentive farmer. 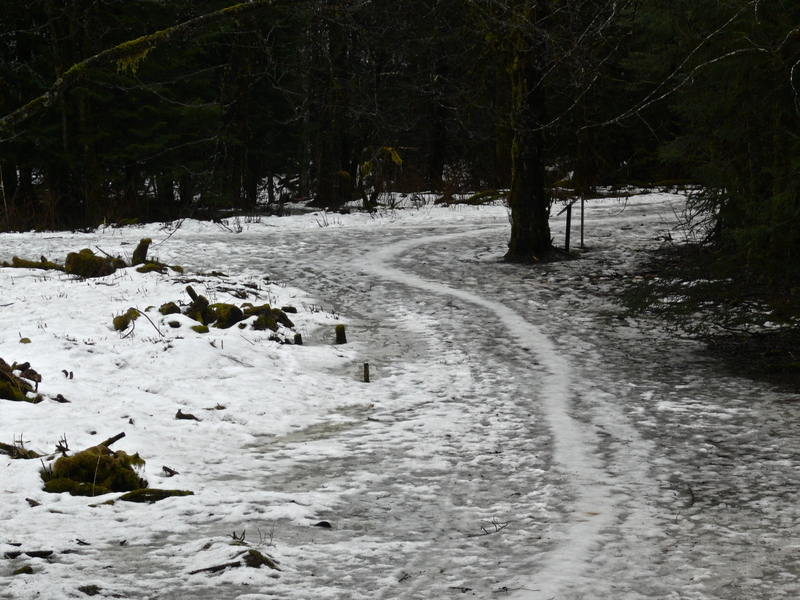 Crossing them are recognizable snow machine tracks left by someone who enjoyed banking his machine on steep creek banks, shooting over the shoulder of the big beaver house, and weaving through the bordering forest. Some, maybe the rabbits and deer that watched the show, would find the snow machine driver guilty of crimes. I don’t judge, just hope that the relatively short reach of the meadow will discourage a return. I ski in the snow machine tracks while Aki sniffs about, pees here and there, but ignores the mystery tracks. This tells me that they were machine made. 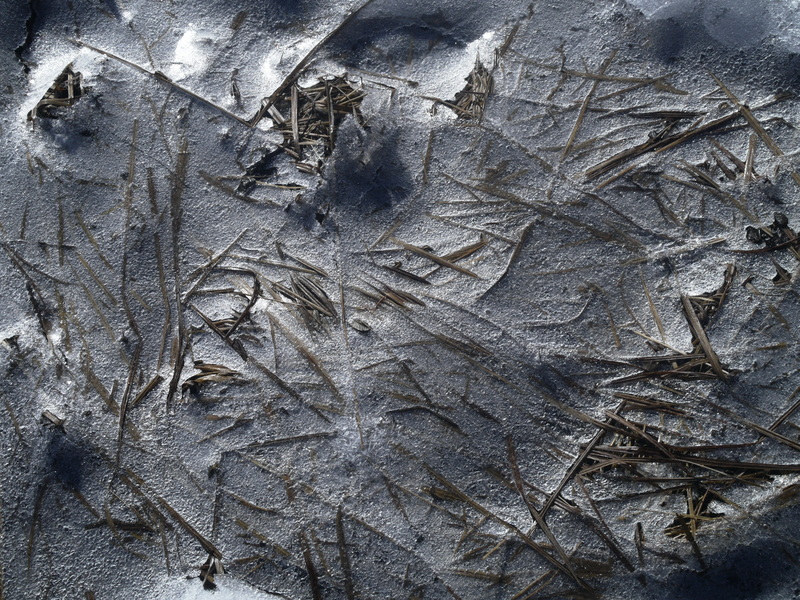 The mystery is solved mid-meadow, where a trail of two parallel wide grooves confirms that the tracks were made by four wheel all terrain vehicles. Stopping, I listen for silence—blood beating a tattoo in my ears, squawks of disturbed birds, then nothing. No wolf howling, rabbit crying, rifle firing, snowmachine whining. I can almost hear the slight breeze ruffling Aki’s ears. 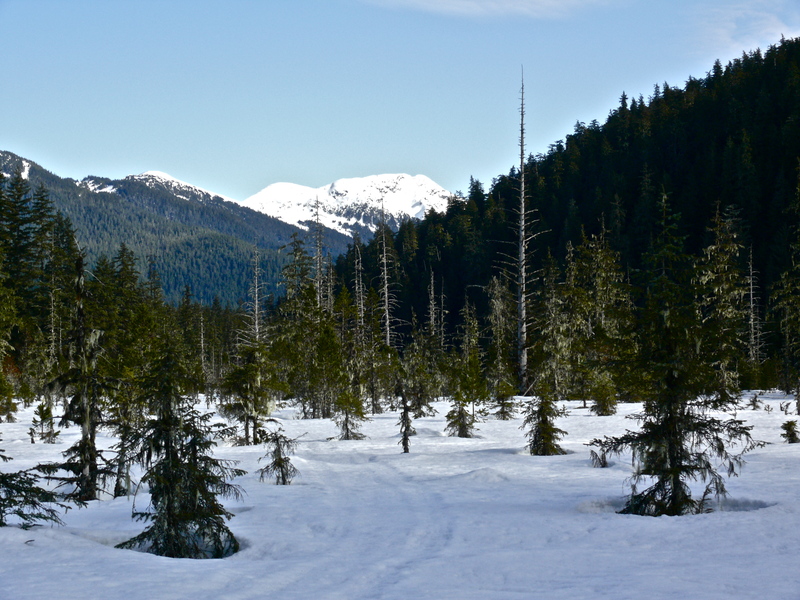 This entry was posted in Aki, Dan Branch, Juneau, Nature, peaceful isolation, solitude, Southeast Alaska on March 31, 2014 by Dan Branch. Like intercity gangs, ravens and crows battle for turf in Juneau. The crows ruled Chicken Ridge when we first moved to the neighborhood. They would arrive at sunrise on a late March day like this, each member of their murder screaming taunts at the us from the limbs of Sitka Spruce trees. With this display of verb gang signs they staked out nesting areas for the summer’s crop of fledglings. One year they returned, found one spruce tree missing and never returned. Now a pair of frisky ravens controls our neighborhood skies. Unlike the cranky crows, the ravens tolerate the occasional visit by bald eagles. On this morning’s walk we found our old crow neighbors staking out the trees along lower Fish Creek. After chasing off three bald eagles, they infested the little spruce covered island that forms part of the stream’s mouth. 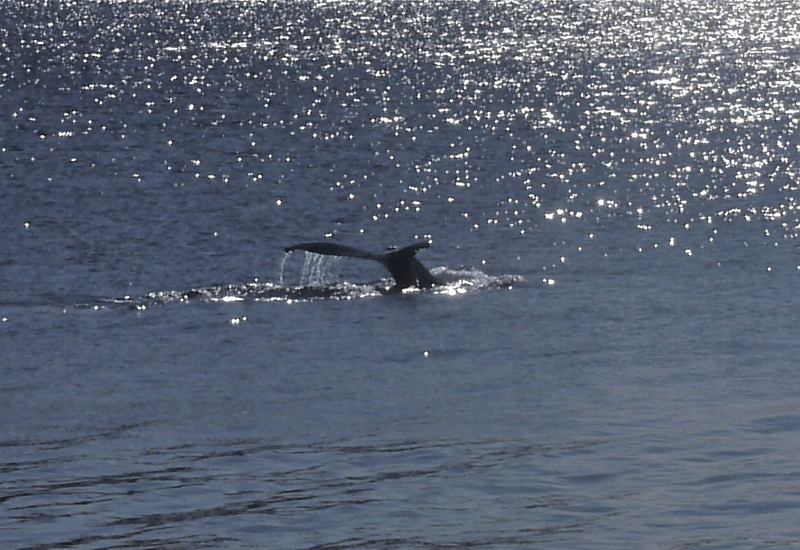 We heard but did not see them while circumnavigating the island. The strengthening spring sun robbed the glacier and surrounding mountains of drama but left us warm and content to let the crows rant. This first taste of true spring might have affected Aki more than I. She shows little interest in passing dogs, and can only manage a half-hearted roll in the disappearing snow. At the end, I find the body of red breasted sapsucker. 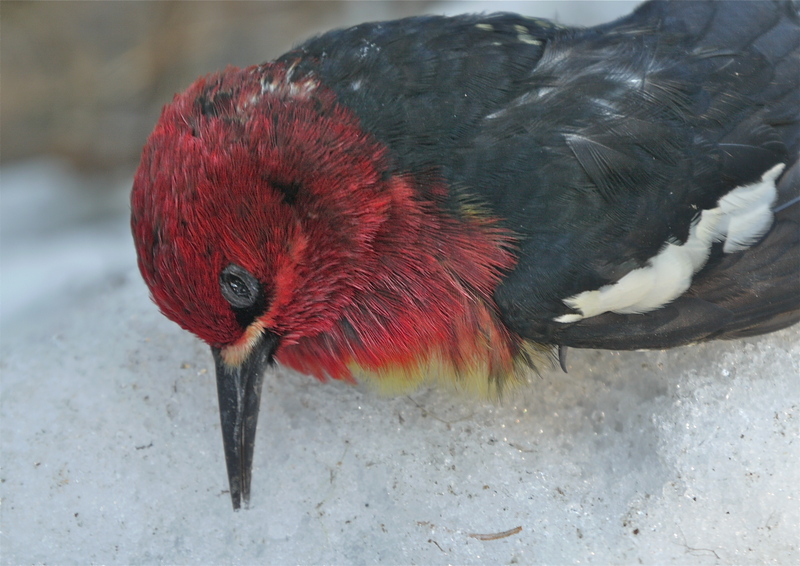 Even in death, it manages a spectacular display of red, yellow, and black against its snowy killing ground. Aki pays the corpse little attention but I can’t resist this chance for a close up view of the eye—dark, speckled pupil floating on a pale blue pond. 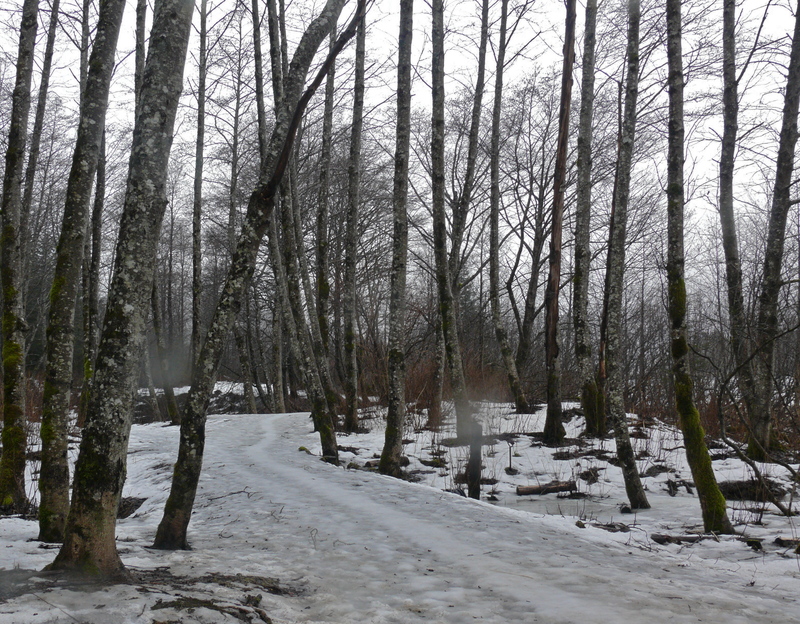 This entry was posted in Aki, Dan Branch, Juneau, Nature, Southeast Alaska on March 29, 2014 by Dan Branch. 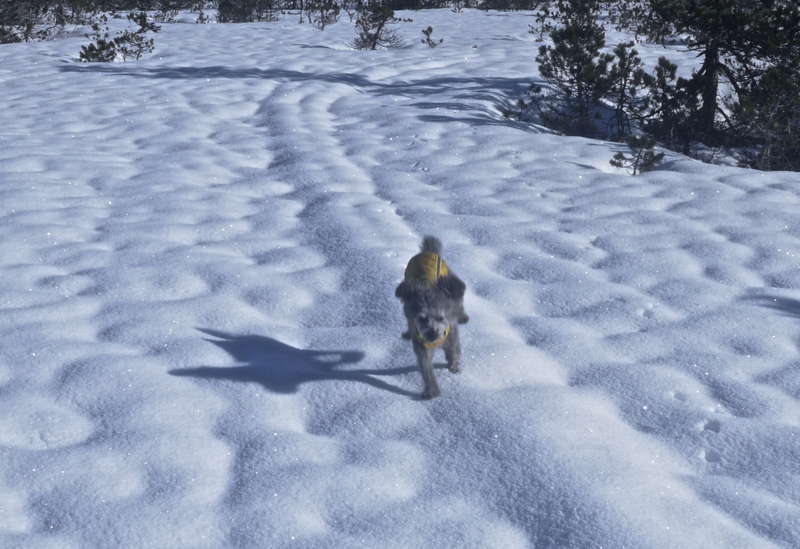 Back from Sitka, Aki’s other human and I take the little dog exploring on the glacial moraine. The wind that has hammered downtown Juneau since our return can’t reach us here. We have sun, lots of snow, and a temperature just below freezing. We want Aki to enjoy this adventure because when it is over she is to be taken to the veterinarian for injections, teeth cleaning, and nail clipping. She dashes over a series of terraced beaver ponds while I muse over the good and bad provided by the industrious rodents. Beavers killed these trees and transformed their beauty from a living celebration to one created by blistered forms. 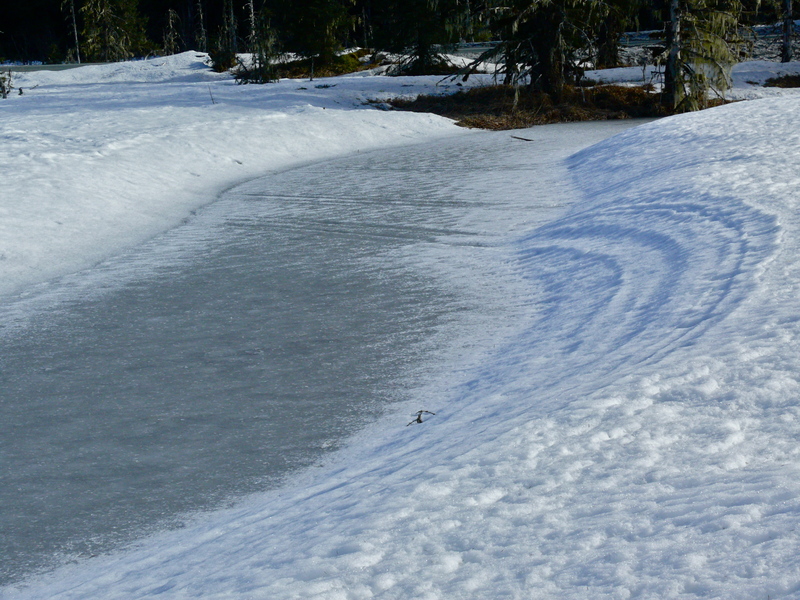 Their dam works create habitat for young silver salmon, some that might be swimming under the ice beneath our boots. But when the temperature rises, the backup from their ever expanding ponds will flood our access trails to the troll woods and berry patches. Finding myself neutral on beaver beauty, I concentrate on a cottonwood leaf that has spent the winter trapped by the cold. 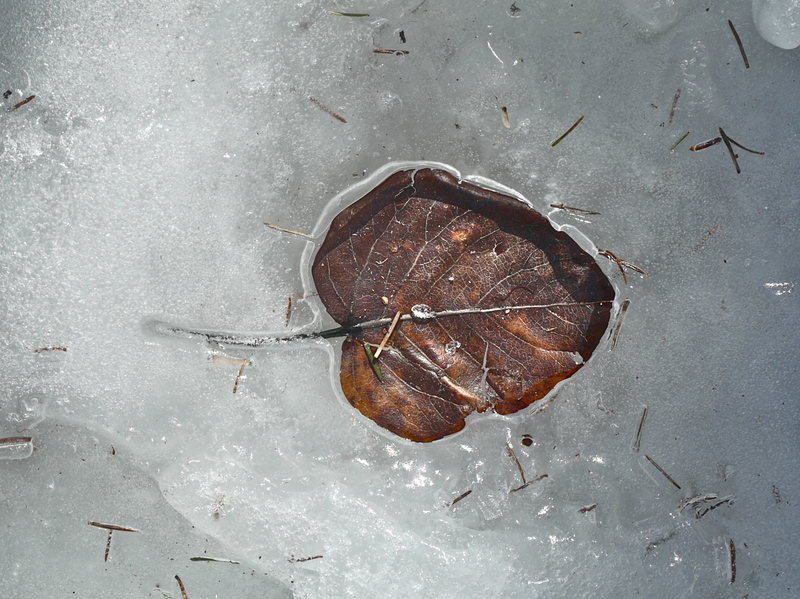 Like the beaver, the dead brown leaf transforms the moraine, using the heat from spring sunshine to carve Itself a steep walled sanctuary in translucent ice. 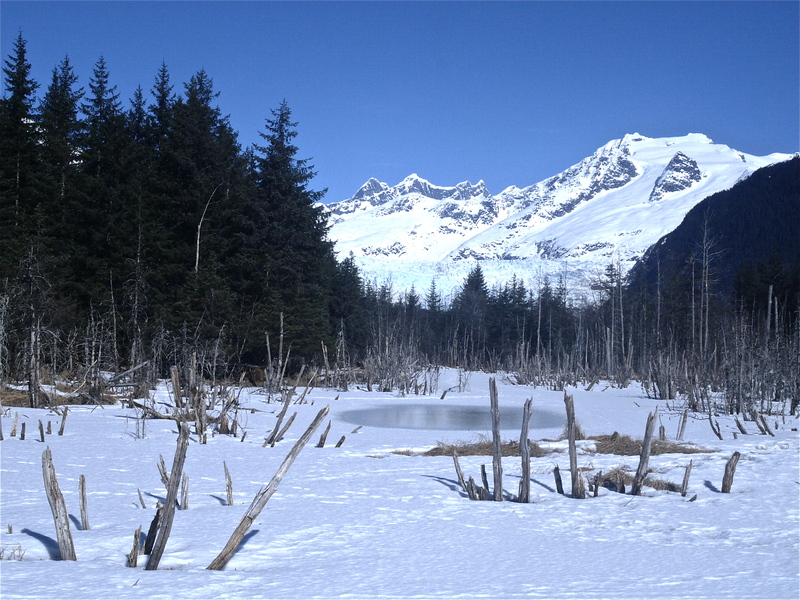 This entry was posted in Aki, Beavers, Dan Branch, glacier moraine, Juneau, Nature, Southeast Alaska on March 27, 2014 by Dan Branch. 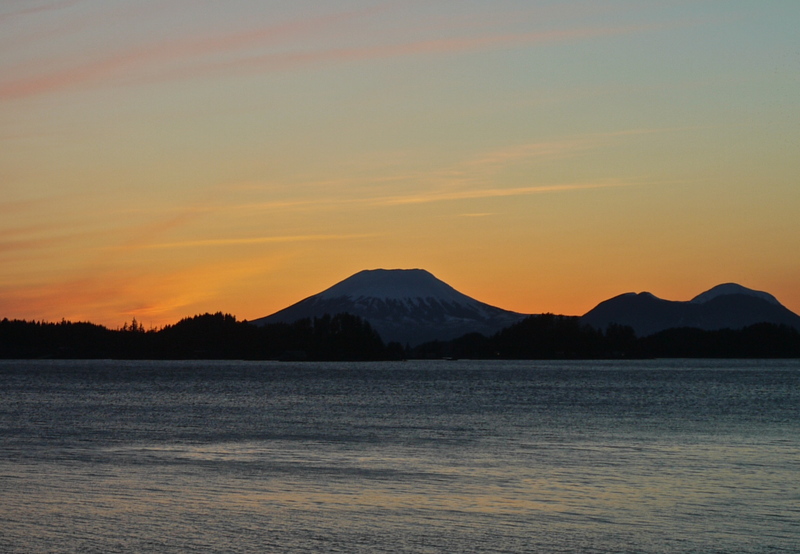 Sitka’s natural harbor has drawn sea going men for centuries. Huge and dotted with spruce covered islands, it provides safe anchorage for shipping along a dangerous coastline. On one edge, the Mr. Edgecumbe volcano mimics Japan’s Mt. Fuji. During Japan’s period of isolation, British explorer James Cook of the British navy named the volcano for a hill overlooking the port of Plymouth. 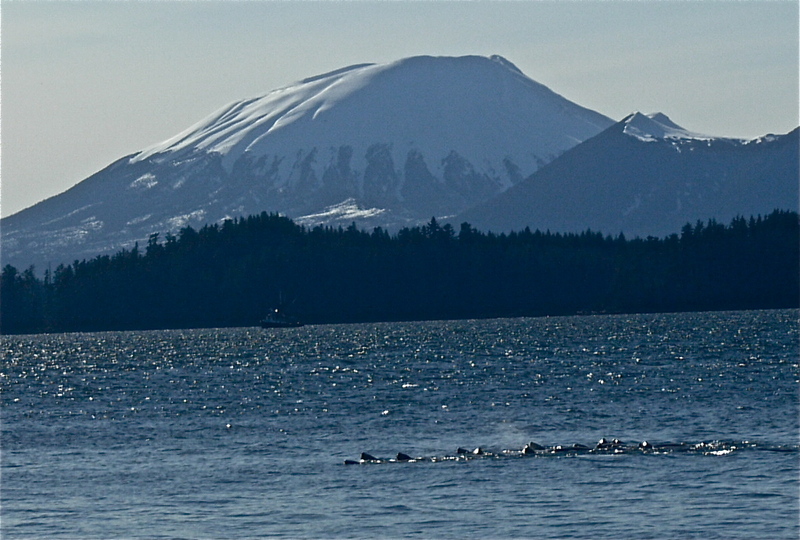 Drinking morning coffee on the sound’s edge, with Aki a 100 miles away in Juneau, I watch a humpback whale flip its tail flukes skyward before resuming its hunt for spawning herring and then turn my attention to the snowcapped volcano. 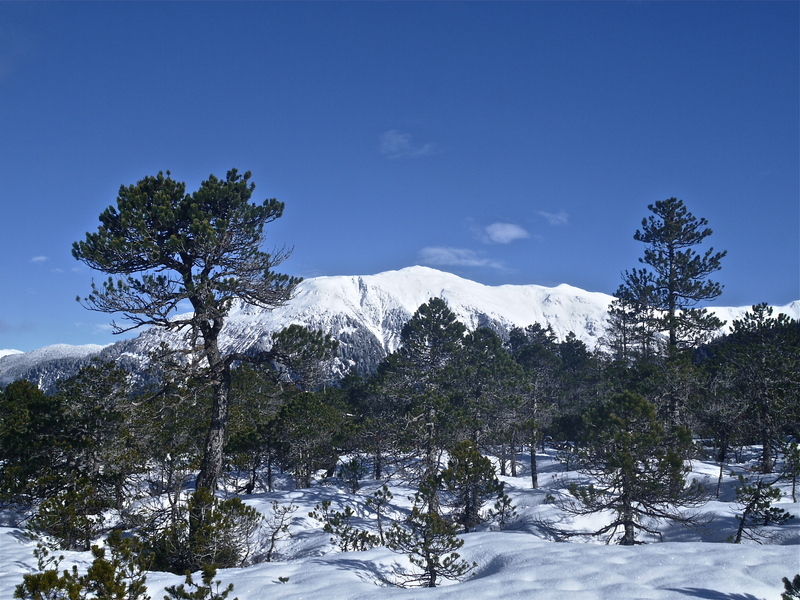 The few clouds in the blue sky cast crisp shadows on the mountain’s snowy sides. Below the shadows, sunlight caught in the dormant lava channels shines brighter than that angling off the waters rippled by the diving whale. James Cook could not have named Edgecumbe on a sunny spring day. Herring provide today’s drama. 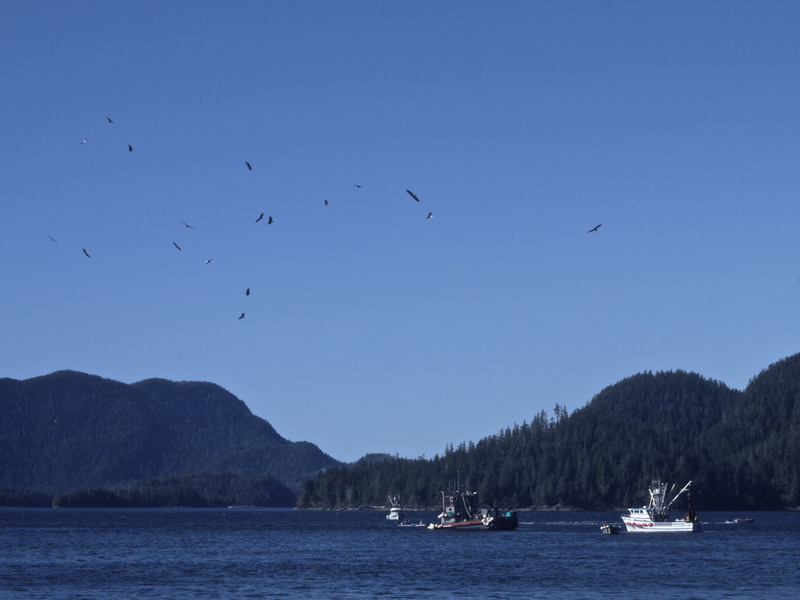 A great flood of pregnant herring approach their spawning beaches and act as a magnet for eagles, gulls, commercial fishermen, humpback whales, sea lions (California and stellar), and those of us who believe that the best of an Alaska spring is found in a bowl of herring eggs, lightly blanched and seasoned with soy sauce. I saw all of it today except the bowl of eggs. The fish have yet to spawn. 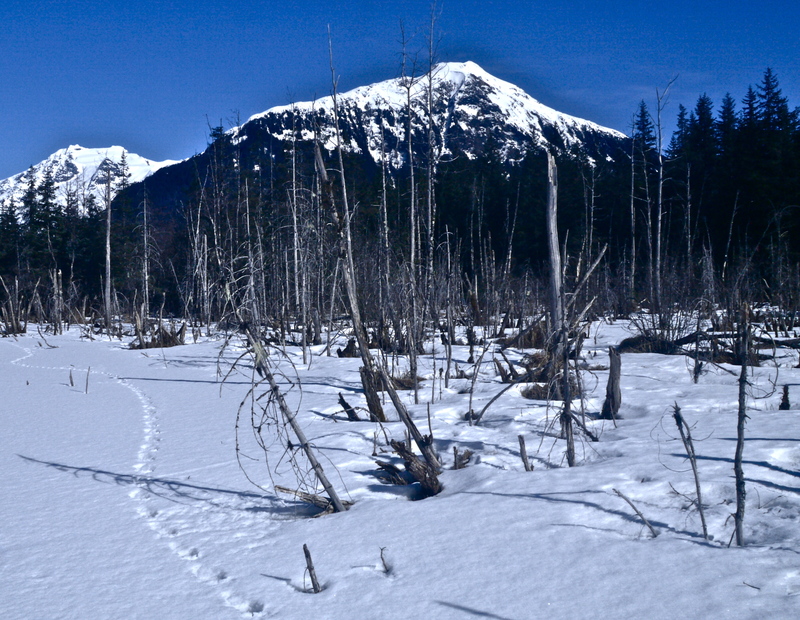 This entry was posted in Aki, Dog Mushing, Kwethluk, Nature, Southeast Alaska on March 24, 2014 by Dan Branch. Lacking commercial value, this large pine and its ancient brothers eked out a living on poorly drained soil? They grew while human immigrants clearcut the nearby spruce forest for timber to build towns and a delivery system for water to the Treadwell mines. 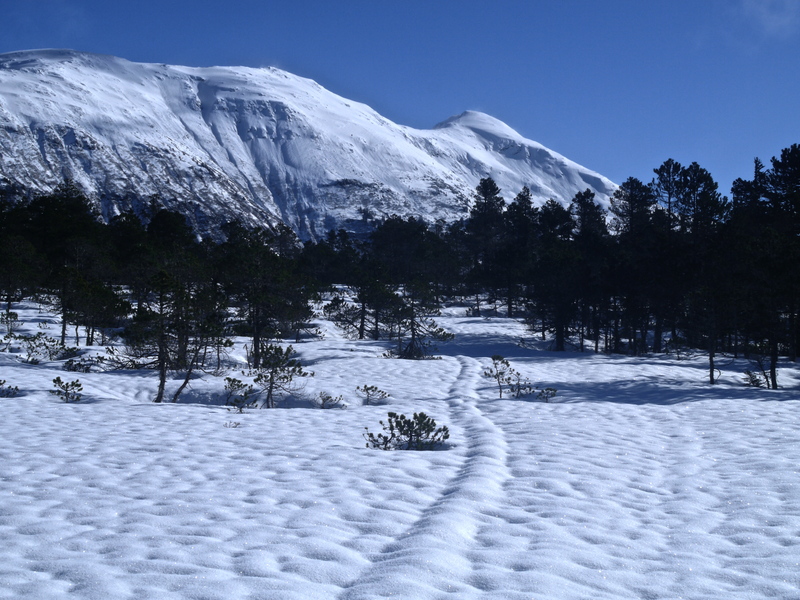 A recent drop in temperature firmed up the meadow snow enough to allow my visit to the old guy. He rises out of a bowl shaped depression in the snow formed by heat that radiated from his trunk and that of a court of brush and smaller trees attracted to his eminence. Aki doesn’t pay homage. 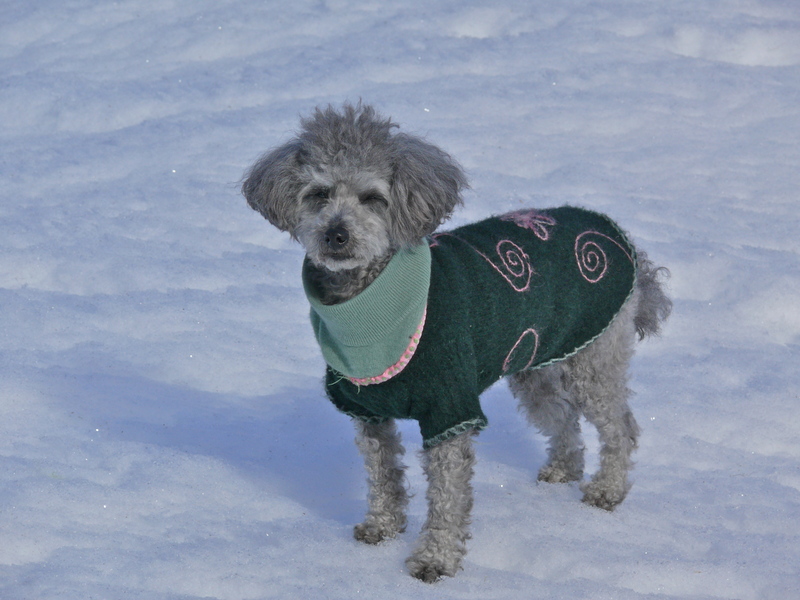 She is too charged by access to the snow covered meadow. Most of the time she can control her enthusiasm but once she burst across the meadows’ firm surface, releasing a happy growl. 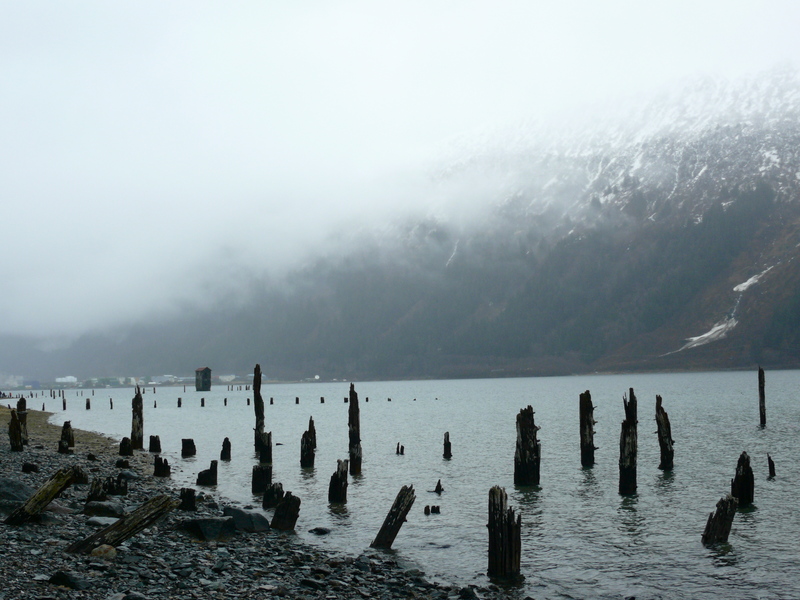 This entry was posted in Aki, Dan Branch, Juneau, Kwethluk, Nature, Southeast Alaska on March 20, 2014 by Dan Branch. The St. Patrick’s Day partying ended when the front street bars closed at 2 p.m. Another party should be going this morning here on the Sheep Creek Delta. 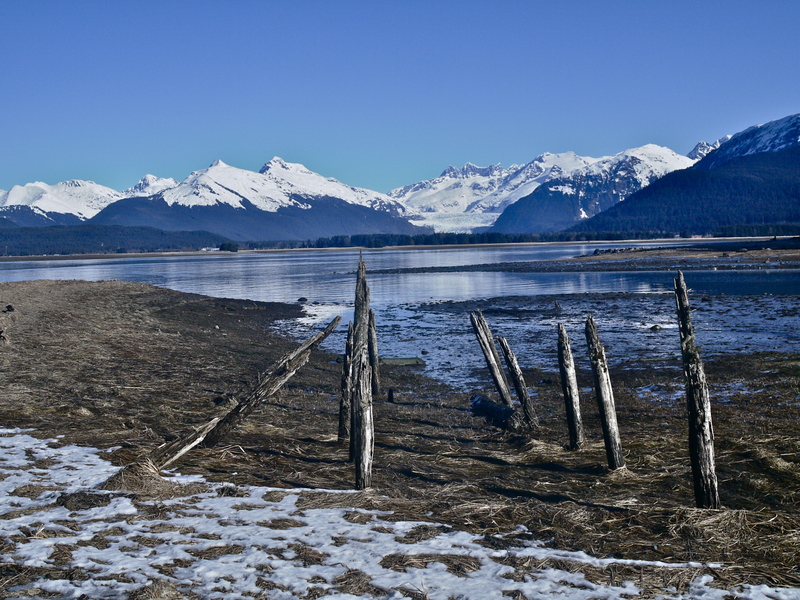 In Southeast Alaska, when the tide is out, the table is set. At first we only see two crows near the creek, loitering about like the trouble makers they are. In a few minutes we find the party. 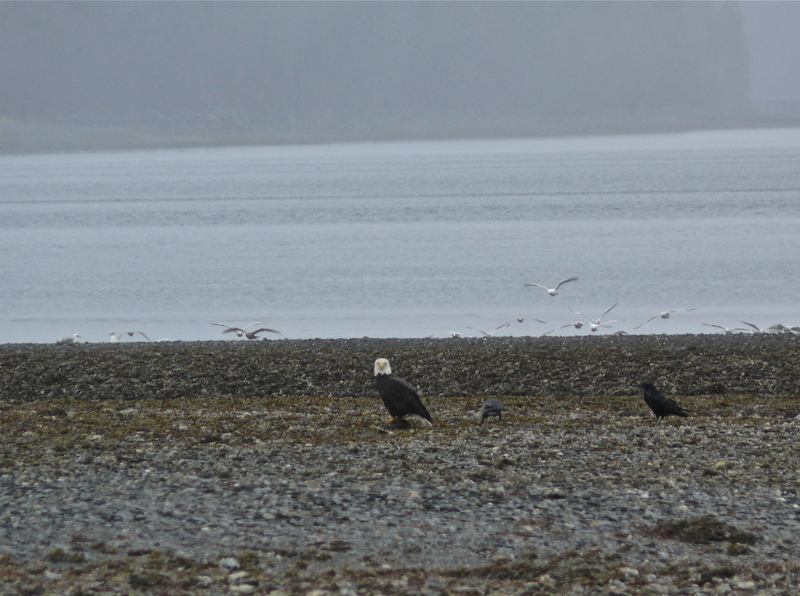 Two eagles, crows and gulls all feed on something tasty near the Gasteneau Channel beach. 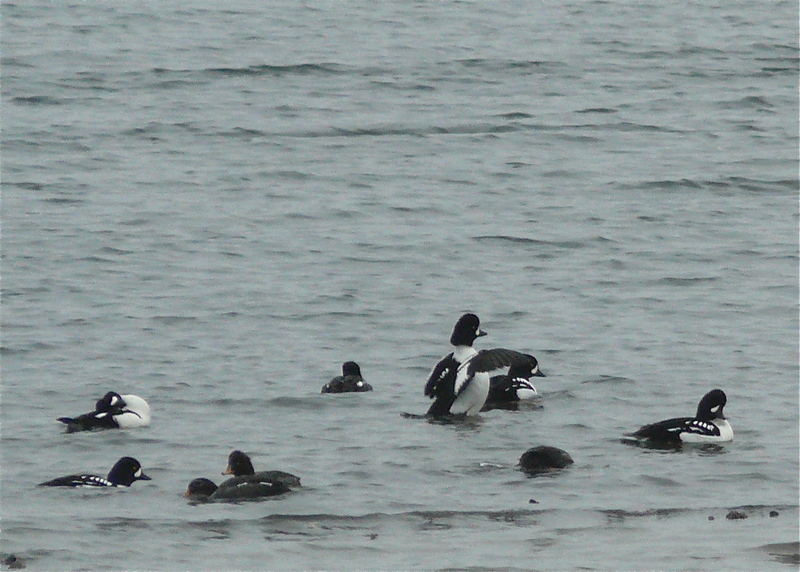 Just off shore, a tight raft of Barrow’s Golden Eye ducks feed in shallow water. Further out, a seal waits for them to move onto his hunting grounds. This entry was posted in Aki, Dan Branch, Juneau, Kwethluk, Nature, Southeast Alaska, Uncategorized on March 18, 2014 by Dan Branch. A profound silence must have settled over Treadwell after they shut down the last stamp mill. 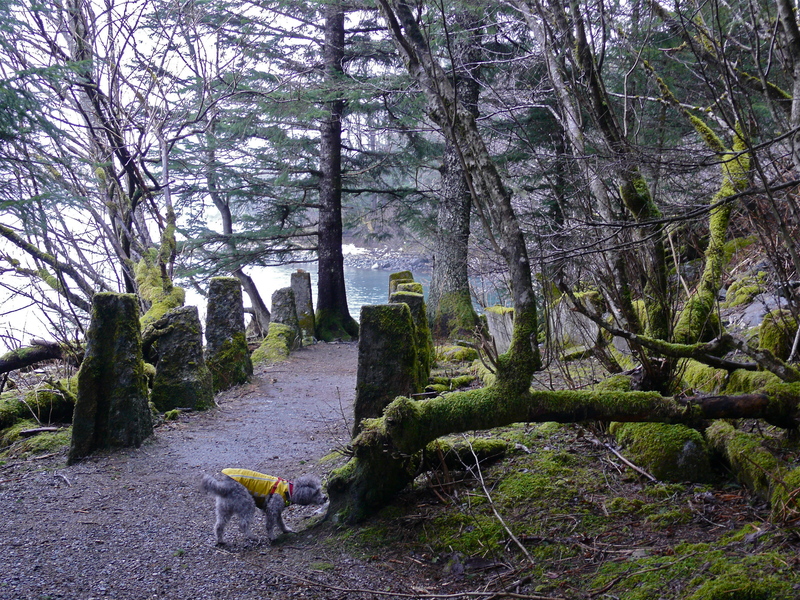 Aki the poodle-mix, my daughter, and I have silence on today’s walk among the ruins of the old mining complex. Low clouds and fog have grounded all planes and no boats bounce down Gasteneau Channel. It’s a time for remembering. Aki sniffs the signs left by yesterday’s dog visitors. I look over the channel for the spouts of the pod of killer whales that passed here yesterday; find a nervous harlequin duck flying through the old mine dock pilings. Inside the hard wood forest devouring Treadwell’s ruins, a strip of snow winds around roofless buildings and huge cast iron wheels that once kept the mills running. It’s a comfortable place for ghosts. On the ninth anniversary of her death, I think of M., a child now forever 14. My daughter skips flat stones from the beach where they both swam on warm summer afternoons. M. would have run through the Treadwell trees and explored the ruins. I can almost see her near the fog line, running down the beach in the rain. We who miss M. must look for peace in clouds that mask mountains, comfort in the rain, and escape from sorrow in happy memories of a giggling girl. 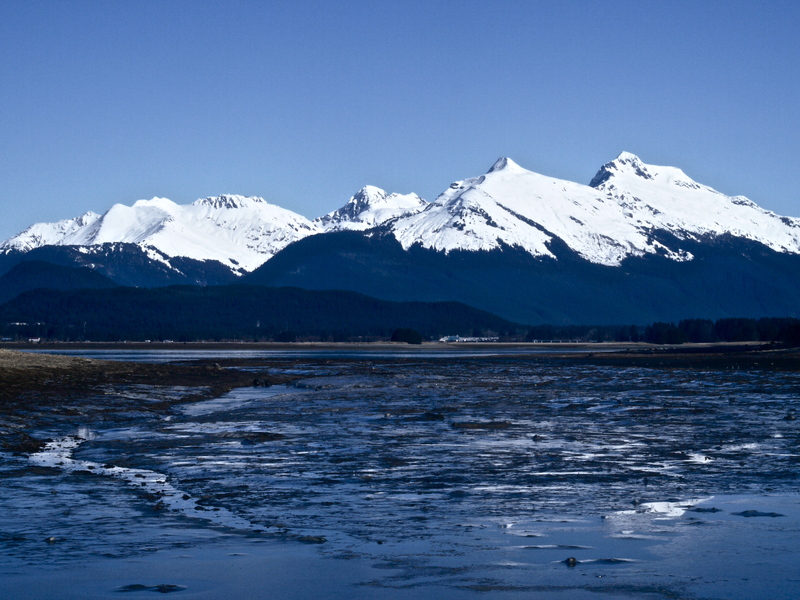 This entry was posted in Aki, Dan Branch, Juneau, Kwethluk, Nature, Southeast Alaska on March 14, 2014 by Dan Branch.